Elizabeth Starbuck at The Colorado School of Mines Oredigger Newpaper published a wonderful article and review on Goozell Yogurt & Coffee, “The Best Fro-Yo Fo-Sho”. 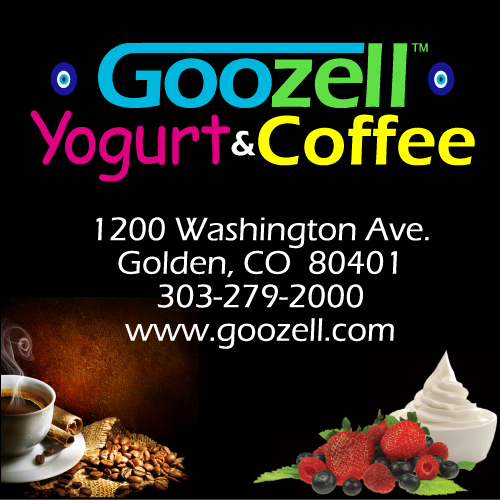 Goozell Yogurt & Coffee is a family owned and operated business located in the heart of historic downtown Golden, CO at 1200 Washington Avenue. 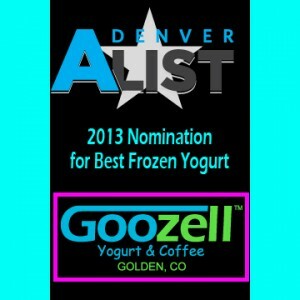 Voted 2013-14 Best FroYo Shop in Denver by Denver’s A-List, Goozell offers the best self-serve frozen yogurt, a full espresso bar and their own custom blend of premium Turkish Coffee. Inquires can be sent to info@goozell.com or for additional information please go to www.goozell.com. 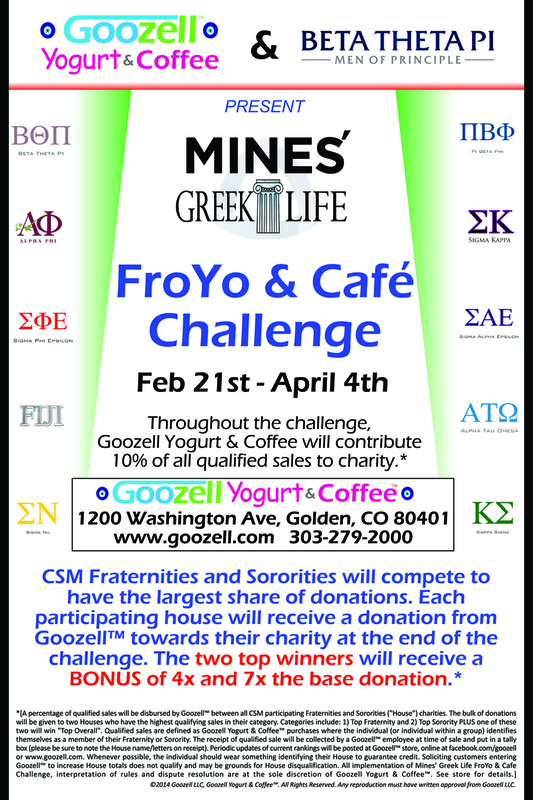 Mines Greek Life – FroYo & Café Challenge! The 10 Fraternities and Sororities at CSM will compete to see who can raise the most for their sponsored charity during the Chalenge. The TWO TOP WINNING HOUSES will receive a bonus to their charities of 4x and 7x the base donation by Goozell. Qualified sales are defined as Goozell Yogurt & Coffee™ purchases where the individual (or individual within a group) identifies themselves as a member of their Fraternity or Sorority. The receipt of qualified sale will be collected by a Goozell™ employee at time of sale and put in a tally box (please be sure to note the House name/letters on receipt). Periodic updates of current rankings will be posted at Goozell™ store, online at facebook.com/goozell or www.goozell.com. Alpha Phi, Alpha Tau Omega, Beta Theta Pi, FIJI, Kappa Sigma, Pi Beta Phi, Sigma Alpha Epsilon, Sigma Kappa, Sigma Nu & Sigma Phi Epsilon. So get your Coffee or Latte fix, indulge with some amazing Frozen Yogurt, all for a great cause! Good luck to all and may all the charities benefit greatly. 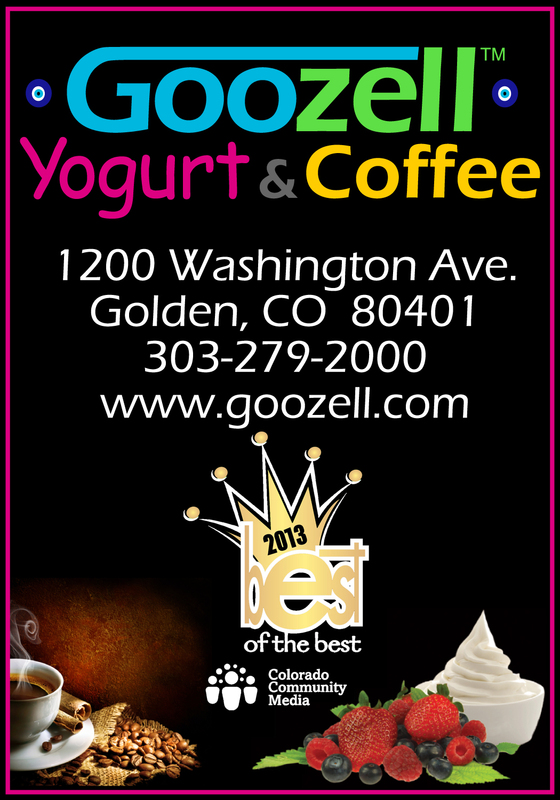 On September 12th, 2013, The Golden Transcript published a wonderful article about Goozell in relation to how we beat out 23 other nominated yogurt shops to be voted Best FroYo in Denver for 2013. Thank you very much! Goozell Yogurt & Coffee is a family owned and operated business located in the heart of historic downtown Golden, CO at 1200 Washington Avenue. Goozell offers the best self-serve frozen yogurt, a full espresso bar and their own custom blend of premium Turkish Coffee. Inquires can be sent to info@goozell.com or for additional information please go to www.goozell.com. Today, Goozell Yogurt & Coffee was named 2013 Best FroYo Shop by Denver A-List voters. 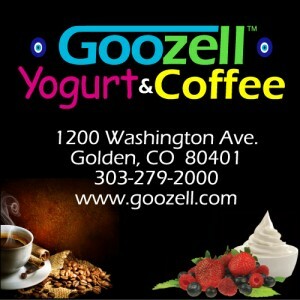 Goozell Yogurt & Coffee is a gem in the heart of Historic Downtown Golden, CO. Goozell is not only a strong fixture on Golden’s main street, Washington Avenue, but also a strong fixture in the community by supporting many local schools, charities, sporting events and more. The word Şerefe is Turkish, meaning, “To Your Honor”. The Turkish reference is no surprise, as Goozell has strong Turkish roots. Brandon’s wife Medine was born and raised in Turkey. The word Goozell also comes from Turkish origins (Güzel ) meaning, “beauty of people, places, food and life passions.” Contrary to many beliefs, the origins of Yogurt can be traced back to Turkey via 2000 BC central asia turkic-mongol tribes. As their name states, Goozell Yogurt & Coffee, is not just great yogurt. Goozell has a full espresso bar and imports coffee beans from Turkey to create their own custom blend of premium Coffee. When you enter Goozell you are struck with images of ‘Evil Eyes’ throughout. A name that is misleading. Evil Eyes are ancient talismans’ thought to ward away evil and bring good luck. Goozell imports these during Medine’s visits to the Grand Bazaar in Istanbul, Turkey along with bags and jewelry sold in the store. Goozell Yogurt & Coffee is a family owned and operated business located in the heart of historic downtown Golden, CO at 1200 Washington Avenue. Inquires can be sent to info@goozell.com or for additional information please go to www.goozell.com. Thank you! Thank you! It has been a wonderful two months of kind recognition by our customers. 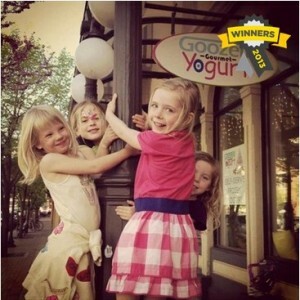 We were nominated by Denver’s A-List for best Frozen Yogurt. Please help us by going to http://ctvr.us/goozell and vote for us. Voting will conclude on August 18th 2013. If you have any questions or comments please email the Goozell team at info@goozell.com. 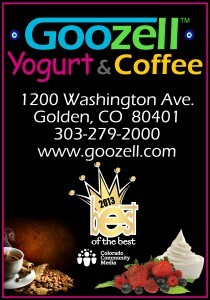 Goozell Yogurt & Coffee has received the 2013 Best of the Best award by Colorado Community Media and the readers of the Golden Transcript for Best Frozen Yogurt. Goozell would like to give a big, “THANK YOU,” to all who contributed to this award. Goozell Frozen Yogurt is pure yogurt (never from powder mixes). In addition, ALL Goozell Frozen Yogurt is certified by the National Yogurt Association to have the highest level of Probiotics (Live Active Cultures including: S. thermophilus, L. bulgaricus, L. lactis, L. acidophilus and Bifidobacterium). The yogurt is cultured and prepared in a Kosher certified facility. Goozell is proud to serve the highest quality frozen yogurt. Trip Advisor (www.tripadvisor.com), the world largest premier travel and destination resource, notified us that Goozell Yogurt & Coffee has earned the 2013 Certificate of Excellence Award. Goozell would like to thank Trip Advisor and all of our customers who have helped to make us stand out and the premier location to visit, try some indulgences, get an espresso drink, sit back and enjoy the location. Golden is an amazing destination site for visitors both local and international; and Goozell is proud to be a part of that experience. 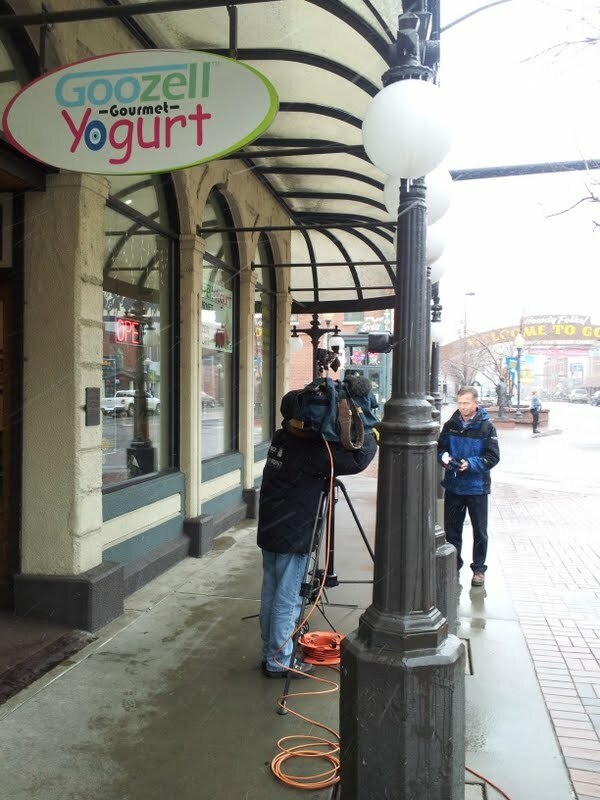 FOX News at GOOZELL YOGURT & COFFEE on April 22, 2013. Interview to air tonight at 9pm on FOX 31 Denver. 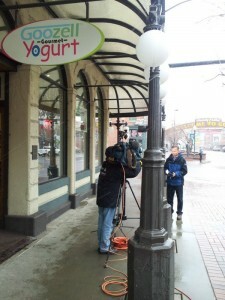 Fox News reporter, Hendrik Sybrandy, and cameraman, Alex Rubin, came into GOOZELL to interview us during the winter storm. We were to busy even with the less than ideal weather. Hendrik asked us why, to which I said I was pleasantly surprised too. I know, I should have let him know it was because everyone thinks Goozell is awesome! Watch Denver FOX 31 News at 9pm tonight (April 22, 2013) to see it. Thank you again FOX News for visiting! On April 27th, 2013 from 10:00 a.m. – 3:00 p.m., there will be a celebration at the new Golden Station on the RTD Light Rail W Line (aka- Jefferson County Government Center). The station is located at 605 Johnson Rd., Golden, CO 80401. From the Station, travelers will be able to take a commuter BUS from the station to Historic Downtown Golden. The commuter BUS will travel at regular intervals. It is estimated that up to 10,000 people may attend this event. Due to the potential traffic, it is recommended that people park in the historic downtown Golden area and take the commuter bus to the event if you are not already taking the light rail W line from another location. Remember to spin the wheel at this event to win gift cards or discount cards for Goozell! We look forward to seeing everyone come visit. 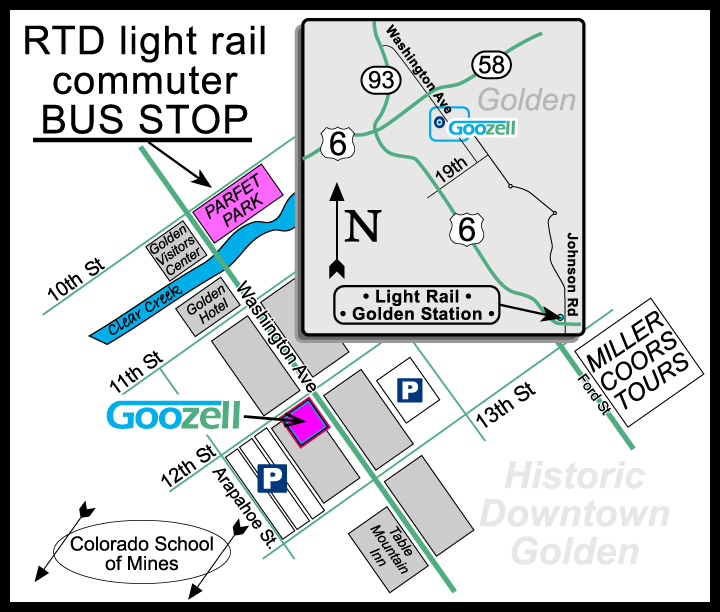 The RTD Light Rail W Line to Golden will have a Commuter Bus from the Station to Historic Downtown Golden. There are a few places to see and get the best deals for Goozell Yogurt & Coffee. 1) You are already doing it, look here on the Goozell News Page. 2) Facebook- ‘Like’ Goozell on Facebook at http://www.facebook.com/Goozell. Some deals are listed here that you cannot see anywhere else. 4) Colorado School of Mines Oredigger Newpaper – Online addition. Go to http://www.oredigger.net to see Goozell specials. Though these ads often target at the students, anyone can take advantage of these deals unless otherwise stated for special events. 5) ASK US AT THE COUNTER! Some discounts or specials are only available if requested. Ask our Goozell team at the counter if there are any specials going on. If you ask, often our staff is permitted to give you specials reserved for those who must mention the deal to receive them. If you have any questions or comments please let us know by calling or email us at info@goozell.com. Visit Goozell Tonight & Win Free Yogurt for a Year | on FREE Goozell Yogurt for the YEAR! "beauty of people, places, food and life passions." back to 2000 BC central asia turkic-mongol tribes.